Col de la Croix Fer is a beautiful climb that first appeared in the tour de France in 1947 when the organizers wanted to add a little difficulty to a stage befor climbing Cold du Galibier via Télégraphe It has now appeared more than a dozen times. 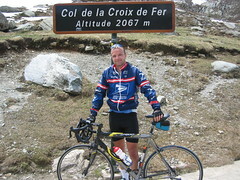 Don’t forget to visit the Top of the Col du Glandon, a 2 minute detour about 2.5 kilometres from the top. Col de la Croix Fer is the first climb in the popular cyclosportive “La Marmotte.” In fact in 2006, I was obliviously climbing Col du Glandon when suddenly several thousand Marmotte riders appeared descending from Croix de Fer – yikes! Blog Entry May 2005 – After a huge day yesterday, I wasn’t sure what was left in the legs – and when it rained during breakfast – I was thinking it would be a rest day. But we drove out to the base of my planned climb and the weather held! 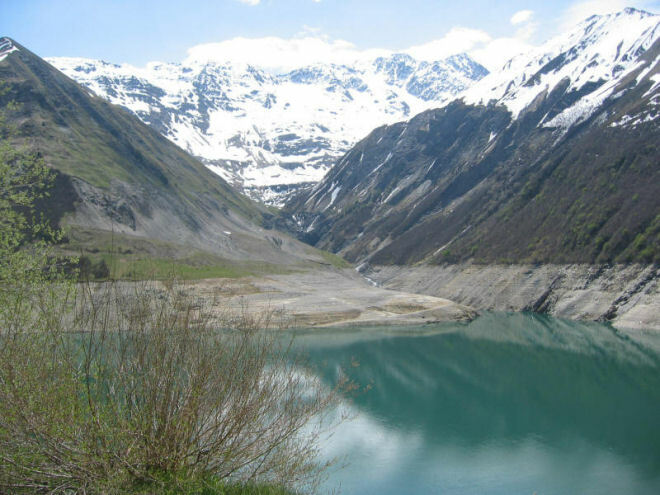 The Col de la Croix de Fer (Col of the Iron Cross) is a famous climb that often features in the Tour of France – It was featured in stage 17 last year which Armstong won. So the road is littered in Tour de France grafitti. In actual fact, the race went 2 kms short of the top turning left at the Col de Glandon. 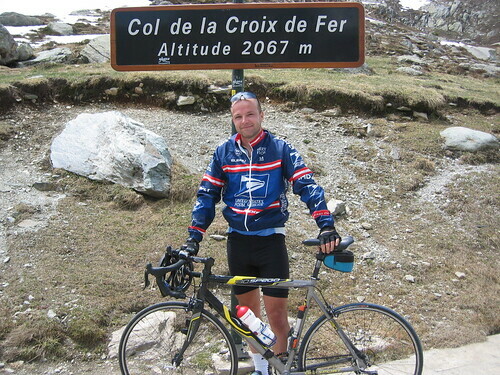 So I of course rode to both – so I could could complete two big Cols with only one climb. It’s an absolutely beautiful 30+ km ride through a tight valley with high mountains on both sides full of waterfalls from melting snow. It’s a little more than 1,500 metres in ascent (+5,000 feet) although only 1,300 top to bottom with a couple of short but steep descents. There are two beautiful lakes created by hydro-electric damns along the way, not to mention some extremely steep stretches. I survived a few tough kms and a short descent, then 2 crushing kms above 10% grade and was thrilled to find that my legs had enough to fly (fly being a relative term) up long stretches of grade between 4% and 8%. GREAT!